Texan Girl Talks: How in the world did that happen?! It's June y'all. How in the world did that happen?! Time is flying. I can't even believe this part... My RN pinning ceremony is less than 200 days away. Of course those are cats in the background, did you expect anything else??! It just hit me that this year is half over, 6 months until christmas. As i've gotten older the years are starting to fly. Somebody make it stop. Studying anti-depressants with Mr. Lou Kitty. He is my study buddy! Does anyone have a cat or dog?! If you do. INVEST IN A FURMINATOR. You will not be sorry. This tool helps shed your cats and dogs for you. It somehow targets the under coat, which is the shedding culprit. This fur was from Lou, he has been throwing up hairballs right and left, and I had to do something. We have done the hairball food, lubricant to help digest the hair and everything else. Nothing was working. I was just about ready to shave this cat. Thank goodness I didn't have to resort to that, but from this picture it kinda looks like I did. So lately I've been really committed to working out and have been really motivated. So after my meltdown last week, I decided to put my energy in to really finding out what i'm made of. Sunday: Did an elliptical workout from one of my favorite blogs, Check out Peanut Butter Fingers blog. If you need some motivation just read a couple of her posts and you'll find some awesome ideas. I also did some arm workouts with the Lat pull machine as well as free weights. Ab and squat challenge. Tuesday: Rest day except for my AB and squat challenge. Wednesday, Thursday, Friday... stay tuned. Have you guys seen this on running around on Facebook?! I think it's a great idea! I love that the pages are full of people rallying around and encouraging each other to get into a routine to work out. This is awesome and you should find it on Facebook and join! It's been a great week and I hope to an even better finish! I hope your week has been great! What workouts are you into this week?! 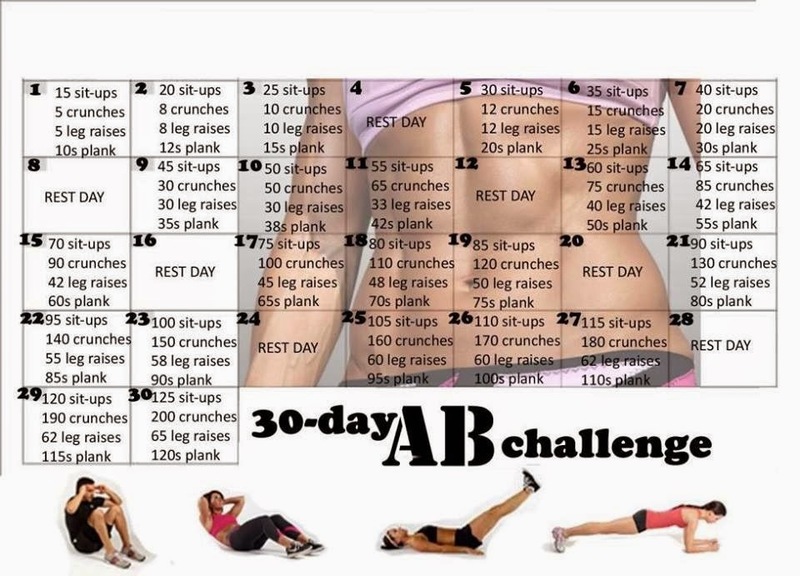 Have you joined the Ab or Squat Challenge? If not, what's stopping you?